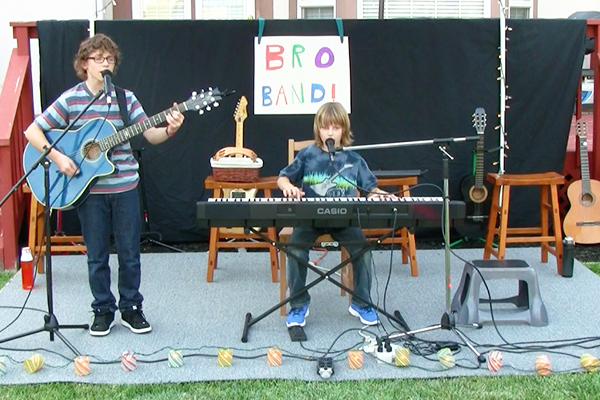 Hi, this is Kellen and Blake, aka BroBand. We are brothers, age 13 and 10, and we love music! We are raising money to buy our own instruments and equipment. For the past two years we have been playing at farmer’s markets, restaurants, and festivals. We have also done fundraising concerts in our back yard and at our school. In 2016 we accomplished our first goal of raising enough money to buy our very own guitars. Now we are working on our goal to get a real piano for Blake (right now he as an electric keyboard). During our concerts we play guitar, piano and ukulele. Come check us out sometime (schedule)! Rock on!